KK Beach, the second property within the award-winning KK Collection has reached the ranking of Number One hotel in Unawatuna on TripAdvisor. KK Beach has become popular amongst both local and international tourists, namely Australian travelers, ranking against 40 properties, based on over 100 guest reviews. The chic, smart-contemporary boutique hotel features access to pristine golden beaches, azure cool waters and breathtaking crimson sunsets off the oceanfront. With almost every experience centered around the majesty of the Indian ocean, whether wining, dining, swimming or lying in bed, KK Beach offers guests a true islander’s luxury experience. 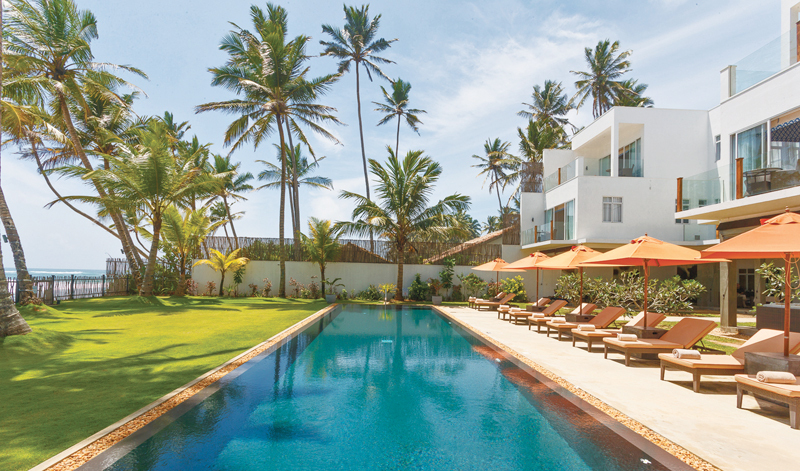 Featuring the ten chic, blue-accented rooms KK Beach has become a favourite amongst top-tier frequent international travellers. “The KK Collection’s boutique properties are more akin to luxe private villas that offer world-class service, tailored to the individual. From the design to the privacy and utmost care to detail, both Kahanda Kanda and KK Beach are cherished by luxury travellers looking for romance, adventure and relaxation. Popular as destination wedding locations for intimate events as well, the KK Collection has cultivated a strong foothold amongst Australian nationals,” commented Founder, KK Collection, George Cooper. The KK Collection consists of two boutique properties: Kahanda Kanda, the first in the KK Collection, is an award-winning boutique hotel located atop a hill, surrounded by 12-acres of tea and a plan-fringed jungle. Popularly referred to as an “an exquisite retreat”, Kahanda Kanda is a hidden gem, defined by its tropical modernist architecture, Koggala Lake views and exclusively luxurious atmosphere. Featuring 10 elegantly designed suites and villas - the property boasts tranquility and timeless, tropical style and has become a favourite retreat for travellers seeking an authentic, luxury experience whilst in paradise.